Last week we discussed Colorado sunshine and chalking paint. Today, we explore blistering paint. What it means, how to prevent it and how to fix it. As we have mentioned before, heat from the sun and UV radiation are important to look out for when protecting your property. The sun is more intense in Colorado. Cloud cover is scarce and at higher elevations our property is more susceptible to the sun. Maintaining exterior paint is important for function and aesthetics. If paint is bubbling and blistering it will peel. Peeling paint looks bad and also indicates that the paint can no longer be a protective outer shell. It is crucial to have a protective layer between your property and the outside world to prevent damage. The powerful rays of the sun can cause fading, chalking, blistering and peeling paint so it is crucial to check the state of your property and make sure you are reapplying when necessary. If you get a bad sunburn your skin can start to blister. The same thing can happen to paint. Paint blistering is caused when paint is applied to a hot surface and dries before it has time to adhere to the coat or surface applied before it. The hot Colorado sun plays a major role in the exterior of your property. Surface temperature must be considered before painting. The heat from the sun causes the paint to lose its adhesive properties and dry and bubble instead of adhering and drying flat. Blistering also occurs if there is excessive moisture or the surface is dirty. This is why it is so important to have a professional painting company paint your property. They know how to properly prepare any surfaces painted and paint in the right conditions to prevent blistering. Plus, the job will be protected under warranty if something does happen. How a property looks can increase or decrease the value. A poorly painted house will not be worth as much as a newly painted home. Just as a bad paint job on a commercial property can devalue that space and discourage patrons from visiting. Therefore, it is important to check on the status of your property’s paint to maintain its appearance and function. Looking for sun damage and catching it early can save you money. 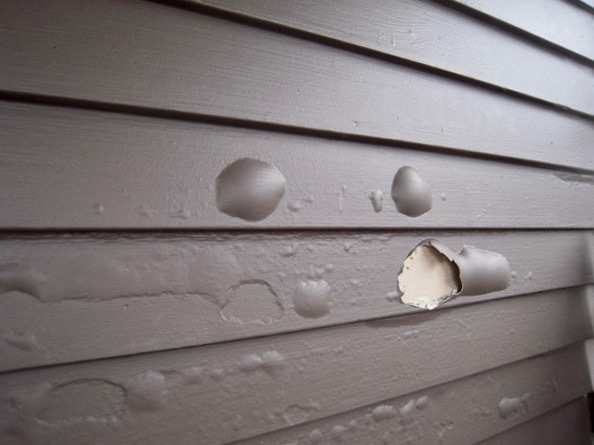 If left alone, exposed, unpainted areas can start to damage the buildings siding and interior. Protect your property today! Do you have a commercial or residential painting need at one of your properties? Contact Colorado Commercial & Residential Painting today by sending an email to trevor@coloradopainting.com or completing a contact form to get a free estimate for your next project. Tune in next week for the last edition in our Colorado sun series! We will discuss peeling paint and how using a professional painting company will save the exterior of your building.